What were the effects of the Reformation? Project Requirements: Your project must represent the content covered throughout this unit of study. Make certain to clearly present the ideas of Lutheranism and how it contributed to how the Reformation "spread" as well as its "impact" on Europe. The first major Protestant sect was Lutheranism. Lutheranism began in Germany after Martin Luther was excommunicated by the Catholic Church in 1521. Luther was a Catholic priest and scholar. He taught scripture and theology (the study of religion) at the University of Wittenberg. As he studied the Bible, Luther became troubled. He could not find a basis in the Bible for many Church teachings and practices. He was also upset about corruption in the Church, especially the sale of indulgences. Luther tried to work out his differences with the Church. But after his views were condemned, he started the separate movement that became Lutheranism. Beliefs About Sin and Salvation Luther and his followers disagreed with the Catholic Church about sin and salvation. Catholics believed that people earned salvation by following the teachings and practices of the Church. Taking part in the sacraments was essential. For example, the sacrament of baptism wiped away original sin. In Christian belief, this was the sinful condition passed on to all people by Adam, the first man created by God. Once they were baptized, people needed to pray, take the sacraments, follow rules laid down by the Church, and perform good works. Lutherans did not believe that people could do anything to earn their salvation. Salvation, they said, was God’s gift, which people received in faith. People would be “justified,” or saved, if they sincerely believed in Jesus Christ, were sorry for their sins, and accepted the words of the Bible as truth. Luther called this “justification by faith.” Those who have faith perform good works and avoid sin because God commands them to, not in order to earn salvation. 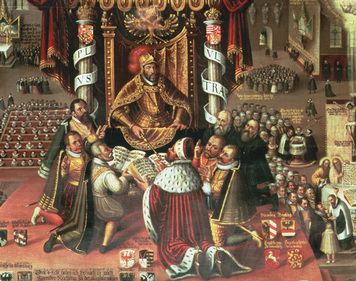 Ultimate Source of Authority Lutherans rejected traditional sources of religious authority, such as Church councils and the pope. They believed that the Bible was the only true source of religious guidance. Reading the Bible was the only way to learn how to lead a good life and gain faith in God. Lutherans published the Bible in several languages so that people could read it for themselves. Rituals and Worship Lutheran services combined Catholic practices with new Lutheran ones. Lutherans met in church buildings that had originally been Catholic. Like Catholics, they used an altar, candles, and a crucifix, which represented the crucifixion of Jesus. Lutheran services resembled the Catholic mass in several ways. The services included Holy Communion, the Christian ritual of sharing bread and wine to commemorate the last meal Jesus shared with his disciples before his death. Lutheran services also included Bible readings and a sermon, in which clergy explained the day’s lesson from the Bible. Like Catholics, Lutherans sang hymns. Luther wrote hymns for his followers. He used German words and often set hymns to popular tunes so everyone could learn them more easily. Other parts of Lutheran worship were different from Catholic practice. Prayers were written and spoken in German, not in Latin, so that everyone could take part. Instead of having seven sacraments, Lutherans had just two: baptism and Communion. Luther believed that they were the only sacraments clearly named in the Bible. Community Life Luther gave his followers certain rules for how to live. Over time, he preached less about the Bible. He began to place greater importance on discipline and strong families. He said that fathers should teach their children religion by having them pray before meals and before bed. “Unless they [pray],” he said, “they should be given neither food nor drink.” He also thought that women should get married and give birth to as many children as possible. He believed that these rules would help to strengthen Lutheran communities. Unlike Catholic priests, Lutheran ministers, or members of the clergy, were free to marry. Luther himself married a former nun.